Though the setting up of a Central University is the prerogative of the Union Ministry of Human Resources Development (MHRD) it shall be in the right spirit of adherence to the Constitution and to our federal structure if it is done in consultation with the state in which the university is proposed to be set up by trying to appreciate the special needs and perceptions of the state administration, the elected representatives, leading academics and intellectuals. A unilateral imposition without taking into consideration the actual ground reality or expectation is bound to generate an atmosphere of distrust and bickering and invariably dilute the larger vision and goal of the effort.While it is a more fundamental debate as to why a large number of central universities have to be created without adequate resources, space and manpower and more importantly without a distinct goal for excellence, it would perhaps be in the best interest of the entire project if the selection of a location for the Central University of Bihar (CUB) is best left to the people of the state to deliberate and decide upon. The Bihar Legislature has already adopted unanimous resolutions asking the Centre to establish the CUB at Motihari in East Champaran district and there is a debate going on within Bihar itself on the proposed location of the new university with a group pitching in for Gaya, which was the initial proposal of the MHRD and another voting for Motihari which has been the favourite spot for the Chief Minister, Nitish Kumar. By appearing to be intransigent on its choice of Gaya, the MHRD is only further widening the divide and generating adverse reaction at a time when it can well do without such a furor. In fact our national tendency of parachuting a central institution of higher learning by disregarding the ethos of the people and the ground realities has nearly always prevented such institutions from evolving into centres of academic excellence. It is true that regional aspirations are growing and it is legitimate that the young in the states and in the districts aspire for national institutions that can bring them en par with the youth in the metros but it does not seem to serve the purpose if such initiatives are divorced from the actual needs and possibilities of the region. Therefore passing an act that declares the setting up of 14 central universities all over the country is one thing, but to formulate a unique vision and aim for each one of them needs a different approach altogether. Historically; the setting up of institutions of higher learning had been a vibrant part of the Indian civilisational experience. The ancient Indian universities of Takshaśilā, Nālandā, Valabhī and Vikramaśilā were some of the leading knowledge-lighthouses of the ancient world and were unique in their growth and in their approach to knowledge and in their method of imparting it. The ancient Indians were adept at creating these institutions which grew in an organic manner over a period of time. The process of this growth seems to have been so steady and so rooted to the ethos and demands of the age that the institutions thrived for centuries providing intellectual direction to the evolution of civilisations and more importantly also served to facilitate – in those days of intimidating distances – interactions between world civilisations. They lived dynamically and grew and only saw decadence and destruction at the hands of invading hordes. 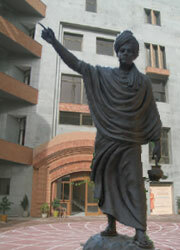 It has been rightly pointed out that the centres of higher learning in ancient India ‘were unique in their organisation and scholarship during those distant times when elsewhere in the world very few had thought of organised education at the university level.’ Most of these universities were international as well as inter-provincial in nature and maintained a high standard with well laid down and meticulously conceived stipulations and criteria for admission. In Nālandā, it is well known that, ‘streams of pilgrim-students wended their way in search of knowledge’ from Tibet, Korea and China and in India from the central regions, from distant provinces such as the North-West, ‘Kāñchipura in the South, Purusapura (modern Peshawar) in the North and Samatata in the East.’ The university of Takshaśilā is said to have had such a vibrant and erudite faculty that they ‘could attract hundreds of students from distant parts of the sub-continent, in-spite of the long and dangerous journey which they had to undergo.’ It was then believed that the ‘knowledge of these teachers put together represented everything that was worth knowing in those days’ and the institution developed a great reputation in the field of medicine. History says that ‘the royal physician Jivaka who had cured the king Bimbisara of Magadha and also the great Buddha himself of some painful diseases, had studied medicine’ at Takshaśilā. This hoary tradition of developing seats of higher learning was eventually broken; a long interregnum followed and came to an end when British administrators decided to form universities on the British model in the Indian presidencies. The civilisational memory of past indigenous institutions of higher learning was lost or at best became opaque and the British pattern of the university was upheld as the one to be emulated and replicated countrywide. Such a perception was briefly challenged in the first decade of the last century by a dynamic nationalist group of Indian scholars and opinion-leaders who advocated the need of creating national education institutions modelled on the spirit of past Indian educational institutions. The movement, though short-lived, did generate much debate and saw efforts made at building some such representative institutions. Satish Chandra Mukherjee (1865-1948), Aurobindo Ghose (Sri Aurobindo) (1872-1950), Benoy Kumar Sarkar (1887-1949), Lokmanya Tilak (1856-1920) were some of the pioneers of this movement. The much deeper issue, however, is that post-independence, a wide debate on the need to develop a system of national education, or to evolve models of higher education institutions in tune with the Indian civilisational spirit never took off. Even those models of education developed by some of our leading national figures – the Basic Education, or the Nai Talim model, or the Visva-Bharati model – were not sufficiently explored or experimented with in the early years after independence when it was possible to chart out a wholly new and refreshing direction for Indian education. The various dimensions of education and perceptions of knowledge-imparting within the classical Indian paradigm were not considered and a serious and wide-ranging effort of re-discovering some unique facets of the Indian educational past was never undertaken in right earnest allowing – with some modifications – the continuation, replication and perpetuation of the British presidency model of universities. And in our present zeal for creating such institutions we seem to have ignored again our civilisational memory of this past experience and appear to have omitted deriving inspiration from the collective spirit that inspired such landmark creations of the ancient world. There has been no concerted effort at developing such a broader goal of social responsibility. Just because Motihari does not have more than half a dozen good hotels does not mean that no new development initiative can come up there! A central university could very well be the starting point of greater development in the area. A central university in Motihari can work wonders for the development and growth of the whole of northern Bihar and may even go a long way in arresting the rising tide of naxalism in the entire belt. If remoteness is indeed a criteria what explains the setting up of an IIT in then remote Kharagpur in 1950. The historic Hijli detention camp which detained some of our most valiant young freedom fighters was converted into housing the IIT which rose to become one of the premier institutions of technical education in the country. In fact, like Hijli Motihari and East Champaran too are intrinsically linked to our freedom struggle and to the memory of Gandhi launching his Satyagraha. In this context one can also recall that when the Pondicherry Central University was set up in 1985 in the outskirts of Pondicherry no major infrastructure support, except for the town itself, existed in the area with the nearest airport, Chennai, a good 150 km away. Today after two odd decades of the University’s functioning the area has grown significantly and has seen major infrastructure development. A number of central universities founded in the states – in Tamil Nadu, Odisha for example – are located in remote areas. Their failure, for the moment, to attract the requisite number of faculties for effective functioning – the Central University of Odisha at Koraput has been able to fill ten out the sanctioned strength of 48 faculty members, and the Central University of Tamil Nadu located at Thiruvarur has been able to recruit six of a sanctioned strength of 24 – reflects on the MHRD’s attitude towards these newly spawned institutions and not on their location or other local factors. Adequate publicity, attractive incentives and guarantees for research and education growth or even special recruitment drives with special provisions bypassing some of the more tedious bureaucratic procedures could have attracted a greater number of academics – especially the young – to these institutions. The MHRD seems to have failed to effectively undertake such a drive. The Central University of Karnataka, for example, located at Kadaganchi, 30 km from Gulbarga and 250 km from Hyderabad the nearest airport, has succeeded in attracting a good number of faculty members demonstrating that academic scope and teaching opportunities evolved by those laying the foundation of the new institution can and actually does determine the responses to these far-flung institutions. In a country like ours, with massive disparities at all levels especially at the educational, it is only with such initiatives of setting up universities at remote locations that one can really hope to bring about greater educational parity. Therefore remoteness of location cannot, in all fairness, be the principal criteria for rejecting the proposal. The MHRD appointed Site Selection Committee comprising experts have also stated that Motihari falls in the seismic zone and a 1000 acres fertile land would go non-productive if the CUB comes up in the area. Shedding the blinkers, one could think of turning these factors into some of the most unique features of the proposed university – make it a new age model earth-quake resistance edifice with a special focus on agricultural and high-yield paddy research. In any case the people of the area are for the initiative and do not appear to be resisting any move at developing the university. It is a skewed view of things which says that seismically active zones be relegated to the national periphery when it comes to implementing development schemes. Under that logic, large tracts of northern India, including some of the leading corporate hubs, which fall within a high seismic zone, should perhaps be abandoned. What is urgently required is the revamping of our national understanding and vision of a university with the entire nomenclature and our understanding of it requiring massive revision and rethinking. Moreover, from an international outreach point of view, a university in Motihari, which is close to the border with Nepal, - with Birgunj, the gateway to Nepal being roughly 55 km away – can very well be developed with an international outlook and invite students from the neighbouring country, grow into a pre-eminent knowledge hub in the area and work towards developing that segment of the border region important for both the countries. Famed author of the Animal Farm, George Orwell (1903-1950), linked by birth to Motihari, has in any case already given the place an international profile! Gaya should have had long back a global education institution in keeping with its international spirit and its spiritual message, that such an institution has not been thought of in the past six decades reflects our attitude towards the preservation of our spiritual-cultural heritage and the dissemination of their perennial message. Instead of making it an opportunity for jointly working out a grand educational vision between the centre and the state the effort at developing the CUB is fast degenerating into an avoidable blame game and a false show of strength. An effort at evolving a consensus by setting up a joint committee comprising of experts from the state and the centre and with the centre being sensitive to the needs and demands of the state can at least start making things move. In fact a high-level national committee can be formed with leading educationists, intellectuals and education administrators to examine in great detail the entire exercise and vision of setting up central universities in the country. Such periodic scrutiny shall avoid ad-hocism in this very vital sector of our national life and perhaps aid in developing a broad educational vision for higher learning in India in consonance with our civilisational legacy of education and learning. Meanwhile the CUB must come up and come up with a grand vision and programme fulfilling the aspirations of the people of that region! Mazumder Nogendra Nath, A History of Education in Ancient India, Calcutta: Macmillan & Co., 1916. Mukherjee Radhakamal, India: the Dawn of a New Era, New Delhi: Radha Publications, 1997. Sankalia H.D., The University of Nalanda, Madras: B.G.Paul & Co., 1934. Abdul Qadir, ‘CUB issue: CM’s stand puts Sibal in a bind’, The Times of India, April 2, 2012. Abdul Qadir, ‘CM remains firm on Central University of Bihar location’, The Times of India, 31 March, 2012. Santosh Singh, ‘This Round to Sibal, but Nitish not done yet’, The Indian Express, 30 March, 2012. The Bihar Times, 19 March, 2012. Motihari’, The Times of India, March 12, 2012. Basanta Kumar Mohanty, ‘Varsity in Limbo over Strife’, The Telegraph, Calcutta, 3 March, 2012. ‘Himanshi Dhawan, ‘Centre-state site tussle to deprive Bihar of central University’, The Times of India, 3 March, 2012. ‘Bihar Houses adopt resolution on Central University’, The Economic Times, March 1, 2012.